A panel at CES on the future of iPhone apps. 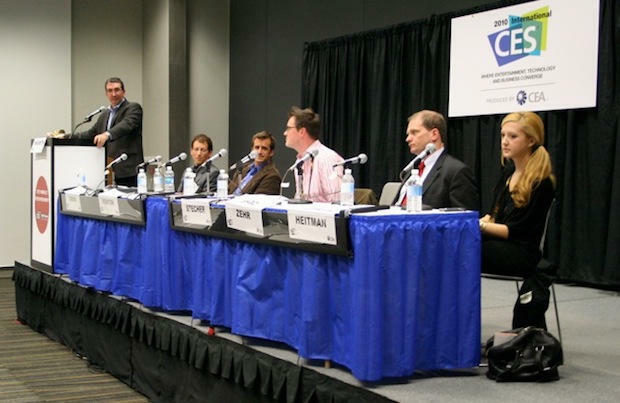 Newsgator's Walker Fenton is second from left. LAS VEGAS — Businesses must have a mobile app. That was the message from a CES panel discussion of iPhone apps and their impact on culture, technology, advertising and entertainment. At the session — iPhone Apps-Change Agents-App Breakthroughs, Video, Games, Mobile Engagement and Advertising — panelists urged companies to get working on mobile apps. Not just for the iPhone, but Android and Palm as well. Fenton added that companies must be on the iPhone.